WalMart truck, on its way someplace, to help people "save money" and "live better", near Boston, Massachusetts, USA. 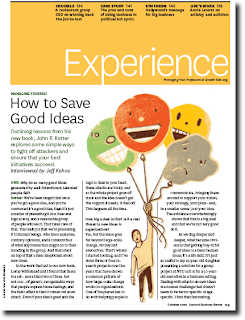 Managing Yourself: How to Save Good Ideas - from the Oct 2010 issue of the Harvard Business Review.This is an interview with John P. Kotter by Jeff Kehoe. 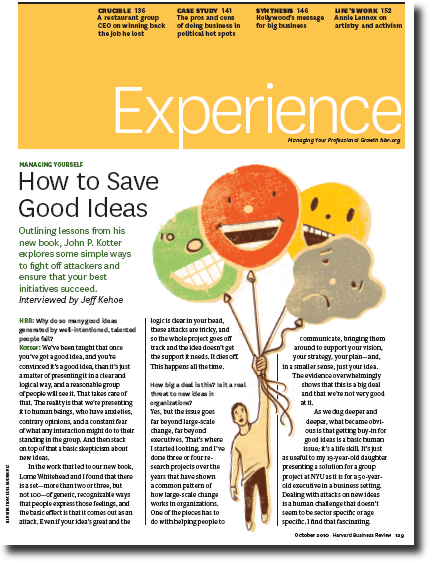 John Kotter's latest book, Buy-In: Saving Your Good Idea from Getting Shot Down , came out. I reviewed it (see my review post here, and my Amazon.com review). The book is quite short, and organized in a way that makes it easy to use as a ready-reckoner. This interview basically talks about the book, about ideas that people have, and how to defend these ideas. Ideas are innovation, while a successful defense of the idea is execution, if one were to put it across as an analogy. Well, it’s one thing to be able to generate ideas by digging up data, analyzing it, and putting it together in some kind of logical way. But gaining the support you need is an entirely different story. It doesn't matter why people are attacking your ideas. It could be malice. It could be skepticism. It could be jealousy. It could be for entertainment - they just happen to be psychopaths. It is really irrelevant, to the extent that the end you need to have in your mind is a successful defense of your idea, of your proposal. So argue the authors. It could be that they’re jealous because you got the last promotion or because you get more attention even though they think their ideas are better. It could be that it’s an innocent skeptic, and one of the ways this skeptic has learned to test ideas is to punch at you and see how well you’ve done your homework. It could be a person who just likes to draw attention in meetings. The premise of the book is riveting - what if governments too decided to fight the drug - cocaine specifically - war in a no-holds barred manner? The narration is tight, but the plot is too linear and without surprises to make it truly remarkable. 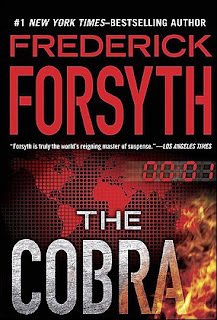 A problem too is the fact that this book will suffer even more when compared to Forsyth's first novel, The Day of the Jackal , which remains, almost 40 years on, the author's best novel, and one of the best thrillers written. The plot, set in the present day, features a black US President with Nigerian roots - yes, that would be Barrack Obama without being named as such - who decides that the horrors wreaked upon cocaine addicts needs to be put down, once and for all, using any and all means necessary. The task falls upon Paul Devereaux, a retired CIA official, who demands and gets a billion dollar plus budget and almost unlimited powers to bring the cocaine industry to its knees, or at least cripple it for a generation. A lot of the novel then moves into the plot, the sequence of steps taken by Devereaux to set the stage and plan for attacking the cocaine industry at its heart. There is a fair bit of information about the cocaine trade, from its source in the jungles of Columbia, to its transportation to Europe via North and West Africa, via desperately poor countries ruled by despotic dictators, and into Europe. The plot described itself is quite ingenious, is tantalizingly real to make it believable, and the ending is realistic enough to make it equally believable. Where the novel lets you down, is that the novel never picks up pace. There is no buildup towards a climax, no real twists, except for one at the very end, and which feels a bit too contrived and put more for the sake of a twist than anything else, and no character development to make the reader get involved with the characters or care much for them. Some of the elements in the plot are too formulaic. Like the good good guys and the bad bad guys. The South Americans are almost all without scruples, the Europeans are all almost heroic, the Africans stereotypically poor, wretched, and corrupt. In a nod to an increasingly globalized world, the shipyard where the ships used by Devereaux are sent for refitting is in Goa, named Kapoor shipyards. 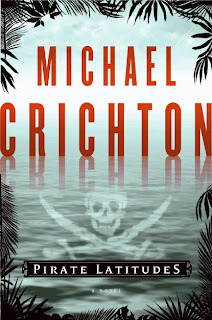 Atypical of most of Michael Crichton's techno-sci-fi thrillers, this pirate adventure set in the 1660s is a most satisfying caper, full of high-seas adventures, chases, gun-battles, cut-throat savagery, plots, coups, and more. Captain Hunter is hired by the James Almont, governor of Port Royal, to attack a Spanish galleon, docked at Matanceros, and protected by the fearsome sadist Cazalla. Hunter assembles a motley crew of the worst of the worst to proceed on a voyage to this port, attack the fort, steal the galleon, and make their way back to Port Royal. There are enough twists in the tale to keep you fully engaged in the novel. The characters are fairly well described, without drowning in details. The life and times of the 17th century come alive vividly in the author's words - and most will most certainly be thankful they live in the 21st century. The scenes describing the gun battles are vivid enough to make you an observer on deck. "Nearby, another man took a direct hit from a ball. It cut his body in half, his legs falling out beneath him. The stump of his torso screamed and rolled on the deck for a few moments until shock brought death." 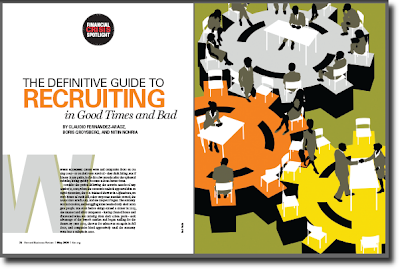 From the May 2009 issue of the Harvard Business Review, The Definitive Guide to Recruiting in Good Times and Bad - HBR.org is an excellent article. In addition to evaluating your new hires, try to find out what happened to the other internal and external finalists. Though it's hard to tell how the candidates who were not hired might have fared had they come on board, it's still instructive to see how well they're performing in their current roles relative to the candidate who got the job. Does this comparison give you confidence in your decision - or give you pause? But, stop and think. How many companies do this in reality? How many companies do this in any organized, diligent fashion? On an adhoc basis perhaps, but of all the candidates a company interviews and decides to not hire, does it really know how well or badly these candidates do afterwards? Sure we hear of anecdotal instances where a manager at a company remarks, "Remember the guy we interviewed a few years back and decided not to hire? Well, he is now running engineering at that hot start-up." This is not as difficult as one may imagine now. The reason for that is the internet. And specifically, LinkedIn.com, the social networking site for professionals, that in 2010 is the defacto online resume portal used by everyone. People generally make it a point to keep it uptodate, with at least their latest job title and employer listed, if not more details. How difficult is it for a couple of people from a company's HR department to trawl through such a site every six months and update their database accordingly? Okay, so do not do it for every candidate you rejected. Do it for people interviewed only for a certain level and above. Like project manager, engineering manager, product manager, director, principal engineer, architect, whatever. Despite the plethora of job titles where there is no agreement on what exactly does one title at one company translate into at another company, there is some form of equivalence that one can arrive at. A person who is a senior engineer today and a senior manager five years later is surely doing something right. This is a business problem that has a technological solution available. Yet the inertia of ineptness and the dogma of convention often overcomes any chance that innovation may have.